So I happened upon this information awhile back while on imdb.com and my childhood memories and feelings clashed together with such glee and horror that there really isn’t a word in the english language to describe it. The voice actor who portrays Optimus Prime has been voicing this character since the original cartoon aired in 1984. Peter Cullen has been in voice acting for ages, it seems, and most of us grew up hearing his voice again and again. We heard him in Votron, My Little Ponies, Teenage Mutant Ninja Turtles, G.I. Joe, The Real Ghostbusters, Duck Tales, Rainbow Brite, and many more. It was a regular day of watching shows with my sons when I heard this voice again… only this time is was coming out of EEYORE! Apparently Peter Cullen has been portraying Eeyore almost as long as Optimus Prime but I had never noticed. I admittedly didn’t watch much Transformers but the voice of Optimus Prime stays with you. I also admit that I DID watch a lot of Winnie the Pooh growing up, but I never made the connection. My world was officially blown. Here are two characters that couldn’t be more opposed to each other. 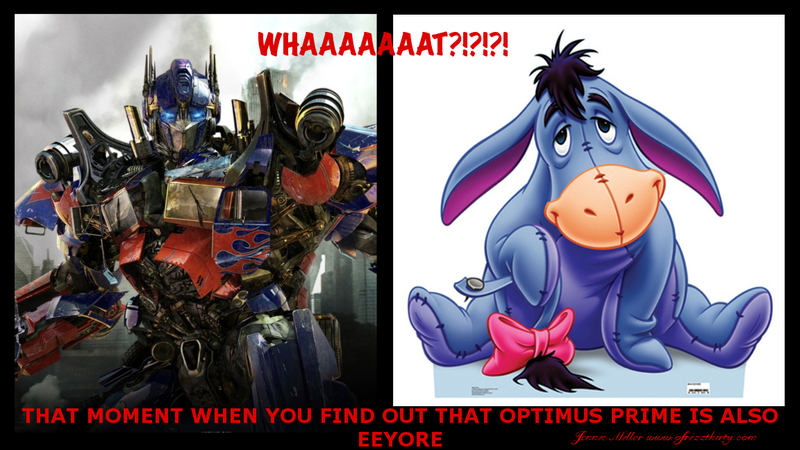 Eeyore is like Optimus’ ANTITHESIS! Well, it just goes to show that Peter Cullen is amazing. He is able to instill the greatest amount of hope and strength in his characters and the greatest amount of sympathy. Here’s to you Mr. Cullen. Thank you for giving me a very rich childhood!